Join the fun! Get free things! Be encouraged in your holy hustle! If you’re new here (welcome! ), Tuesdays are when I swing open the doors to this little space and invite everyone to link up their “Behind the Scenes” stories. We choose a photo (taken today, yesterday, 20 years ago) and tell the story outside the frame. The bits of life and memory that get left out when we edit and filter before sharing online. So grab a photo, put on your storyteller hat, and join us! You can read a little more about it here. This table of smiling faces? It’s a memory I’ll not soon forget – the first time that I can remember my imagination of what Thanksgiving should feel like matching up to reality. 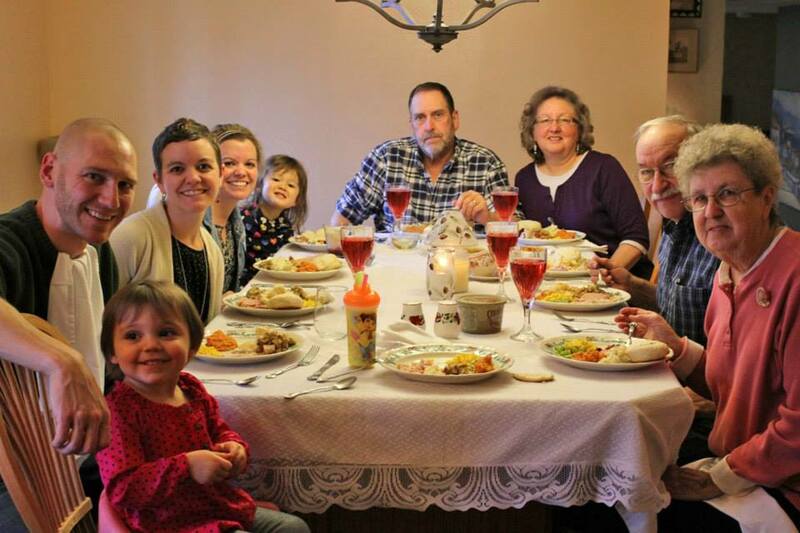 These four generations, gathered around the table, so blessed to be together in a warm home with more than enough food to eat. Toddlers who played well together and let their mommies watch the Macy’s Day Parade in peace over hot coffee (for ten minutes, anyway). It was relaxing, full of laughter and little ones playing soccer on the newly installed dining room floor. An almost four-year-old with enough table manners to know that her cloth napkin belonged on her lap. A two year old who ate more of her dinner sitting on my lap than in her own chair, because … well… that’s how we do things right now. Grace said by little ones who bring more of us to prayer than any pastor I’ve ever met. It was laughter over washing dishes and packing up leftovers, trails of red icing from holiday Oreos eaten well before lunch, daddy/daughter tickle fights and playing with new Nativity sets. The ones with false advertising because “songs” – plural – is actually just one song. Over. And Over. And we now feature baby Jesus on top of the manger instead of the angel, because that’s where he belongs in my little girl’s eye. Behind the scenes of this Thanksgiving scene? Love. Days of hard work to finish the dining room so we had enough room to sit around the table and fellowship. And a heart grateful for a brother-in-law willing to be out of the picture so I could have this photo to cherish. Love your link up. Sure wish I had a post at the moment. I’ll have to work on in. Great stuff!!! Would love to have you join us Alene! YAY!!!! I’m so very glad to see you here my friend! So great…I LOVE this! What a precious photo (and so many memories) to hold close! 🙂 Wishing you a wonderful week, sweet friend. LOVE this Crystal! So precious! And yes – of COURSE that is your twin… and your own little Mini Me too! Totally Adorable for SURE! I know! It’s almost like there are 3 of us! OK, that HAS to be your sister sitting next to you! And your daughter? Oh. my. stars…totally precious and she looks like you too! Unauthorized use and/or duplication of this material without express and written permission from this site’s author is strictly prohibited. Excerpts and links may be used, provided that full and clear credit is given to Crystal Stine and crystalstine.me with appropriate and specific direction to the original content.